Welcome to another review packed episode of Wildstorm Addiction! 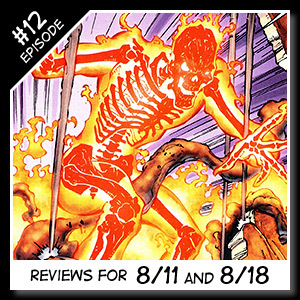 Joe David Soliz and Ben Murphy bring you Wildstorm reviews for the weeks of August 11th and August 18th 2010. Reviews including Gen 13 #37, Welcome to Tranquility: One Foot in the Grave #2, The Authority: The Lost Year #12, Dv8: Gods and Monsters #5, Ides of Blood #1, and X-files / 30 Days of Night #2. 00:00:35 – Joe welcomes everyone to Episode #12 for the weeks of August 11th and 18th. 00:00:57 – Spoiler alerts warning, but all the written Wildstorm reviews at site are spoiler free unless otherwise noted. 00:04:39 – Ben reviews Gen 13 #37 written by Phil Hester, art by Cruddie Torian and Saleem Crawford, and cover art by J. G. Jones. 00:12:59 – Joe gives his take on Welcome to Tranquility: One Foot in the Grave #2. Written by Gail Simone, art by Horacio Domingues, and cover by Neil Googe. 00:22:28 – Ben reviews the final issue in the series for The Authority: The Lost Year #12. Written by Keith Giffen and Grant Morrison, interior art by Jerry Ordway, Kevin Nowland, and others, and cover art by Gene Ha. 00:30:04 – Joe tells us all about Dv8: Gods and Monsters #5 written by Brian Wood, art by Rebekah Isaacs, and cover by Fiona Staples. 00:38:17 – Ben gives his thoughts on the new creator owned series, Ides of Blood #1. Written by Stuart C. Paul, art by Christian Duce, and cover by Michael Geiger. 00:50:05 – Joe reviews the fantastic X-files / 30 Days of Night #2 crossover. Written by Steve Niles and Adam Jones, art by Tom Mandrake, and cover by Andrea Sorrentino. 00:59:37 – Ben gives you both the print and digital Wildstorm Releases for the weeks of 8/11 through 8/18. 01:02:57 – Joe gives you are contact info which you will find below and says good night. The opening and closing music is “Universal Domain” by Dreamline which can be found at http://www.musicalley.com. This entry was posted in Podcast and tagged 30 Days of Night, dv8, gen 13, ides of blood, podcast, The Authority: The Lost Year, welcome to tranquility, wildstorm universe, x-files. Bookmark the permalink.